These 18 Karat yellow and white gold signet rings feature a family crest, hand carved into a blue-gray sardoynx agate. The crest shows through a blue-gray layer with the black lower portion below with detail. The carved gemstone crest is framed with a 19 Karat white gold protective bezel. 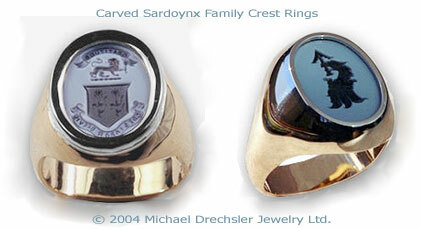 Follow these two steps to get a quote for your own Gemstone Family Crest Signet Ring. Step 1. Email us an image of your Family Coat of Arms, Company Logo, Artwork or Initials as an attachment to mdj@3djeweler.com. Setp 2. Fill out the Request Information - Order Form with following Details and Contact Information. Price range of rings shown is $1800. to $3500. CAN depending on Complexity of Carving, Gemstone Millimeter Size, Gold Karat, and Ring Size. Allow delivery time 2 to 3 months. Plan ahead if this is a gift. Your ring which will arrive in a beautiful rose wood gift box with photograph. Shipping included. Available in Blue-Grey Sardonyx, Red-White Sardoynx, Bloodstone, Lapis Lazuli or Blue Chalcedony. How to Order a Carved Gemstone Signet Ring.